Today’s post comes from Jillian, my gelato loving intern, who made the trip from her Trastevere apartment to Gori Gelato in northeastern Rome. Gori is one of my favorite places and I thought it would be fun for Jillian to make a pilgrimage to the brother-sister-owned gelateria near Piazza Sempione. “The breezy weather Rome’s been experiencing these past few days has done nothing to stop its inhabitants (and visitors) from indulging in the city’s most popular frozen treat. Perhaps that’s just the mystical power of gelato—it goes with everything. This logic has prompted me to eat a gelato nearly every day, which is actually quite a feat, considering that it’s been more than two months since my arrival in Rome. Though I haven’t tired of the gelaterias within walking distance of my house, I certainly have acknowledged the danger of limiting myself to that which is conveniently located. So with this in mind, I headed to Piazza Venezia, where I hopped on the number 60 bus and made my way to Gori Gelato. Gori sits in Piazza Menenio Agrippa, a short walk from the “Maiella/Sempione” bus stop. The residential surroundings make it the go-to place for locals in need of a gelato fix, and I found myself waiting in a line of eager Italian children who, like me, were pointing excitedly at the vast array nestled within chilled metal tubs. The selection ranged from vibrant fruit-bases (strawberry, melon) to deep, rich chocolates, and the creamy pastels of everything in between. For 2.40 euro, my blue plastic cup runneth over with a trio of flavors. And as I am already an indecisive person, having to narrow my Gori experience to only three scoops proved to be a nearly impossible task. Thankfully, the woman behind the counter kindly indulged me with a few samples—first the dark chocolate with orange (wonderfully decadent, but almost too much for an entire serving) and then “Torta di Ricotta,” which was so tasty it demanded a place in my cup. Pistacchio: A flavor that never peaked my interest back in the States, pistachio is one that I now can’t seem to pass up. Gori’s version first grabbed my attention with its beautiful color, a soft shade that showcased the plethora of chopped nuts it held. A hint of saltiness brought the gelato to a more savory end of the spectrum, but as a lover of the sweet-salty combo, I was digging it. Mele e canella: Made without any milk whatsoever, the bold fruitiness of apples and cinnamon acted as a refreshing palate cleanser. The brightness of the tart apples was complimented beautifully by a spicy dose of cinnamon. Ribbons of the spice made their way into every spoonful, keeping my taste buds alert and anxious for more. 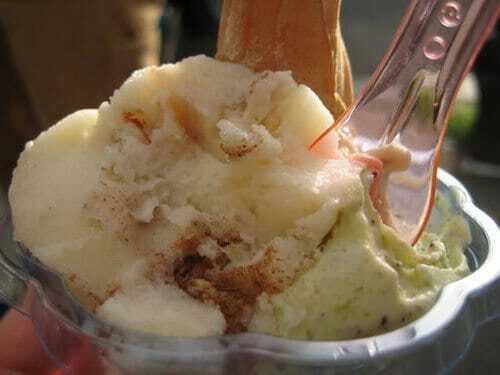 Torta di ricotta: The ricotta cake gelato was rich, bold and smooth with a robust and creamy flavor. Pieces of crumbly butter cake provided a pleasant textural diversity. I ate this one with the miniature cone that Gori adds to every cup, and the satisfying crunch transformed every last bite into a thrill. Oh yum! I’m ‘digging’ your descriptions Jillian! I just had to stop myself from trying to lick my computer screen.